The GOLD PRICE rose $4.50 to $1,090.20 and SILVER rose 12.4 cents to $14.67. All this does is move them up closer to the top of the range, but it ain’t so bad, really. The GOLD/SILVER RATIO plunged 1.05% to 74.319. Listen, y’all, on 7 July the ratio made an intraday high at 77.95. Today it closed Comex at 74.319. It’s in a well-established downtrend. Look at the chart. 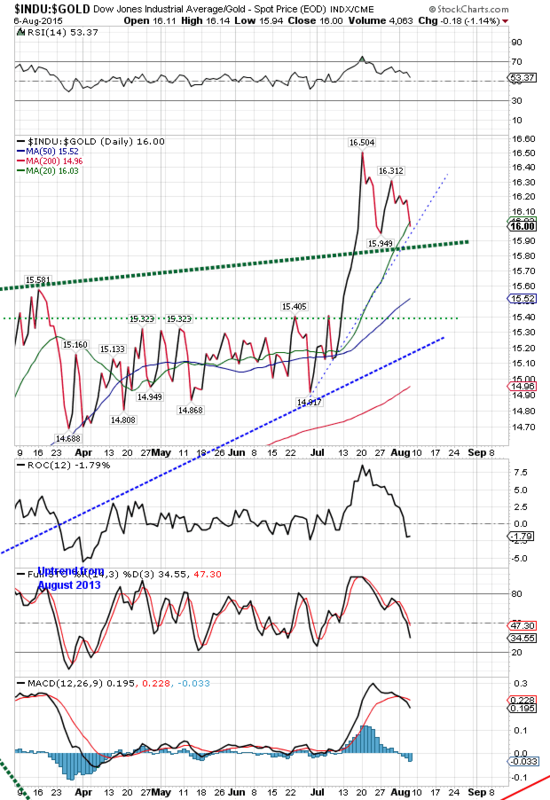 Yet still no clear reversal signal from silver and gold prices. The GOLD PRICE has formed a pennant and is running out of time. Must break one way or th’other soon. Silver has drawn out a range from $15.00c to $14.25. We need some signal that removes all doubt. For starters, the price of gold must hold $1,180 and silver $14.25. 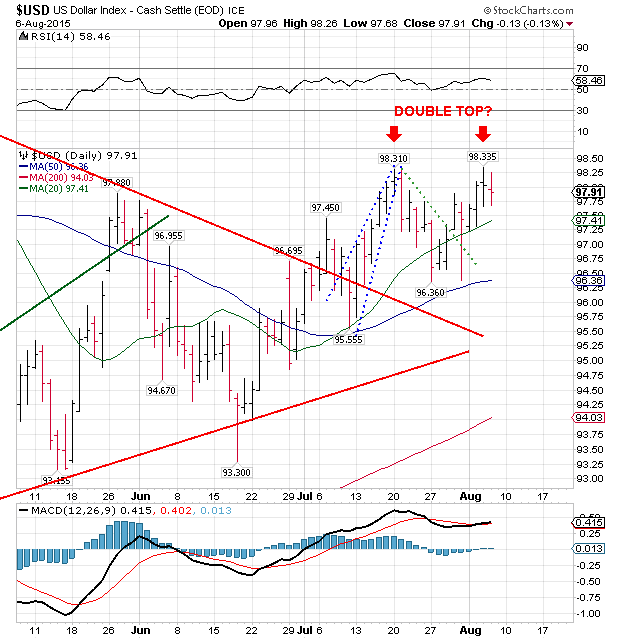 Up above, gold price must break through $1,105 resistance and silver through $15. Actually gold needs a close above $1,094 first. My outlook and feelings have been swinging back and forth like a German Shepherd trying to watch the ball at a tennis match. I try to wring that out of what I write, but I’m as easy to read as 28 point type. Yesterday silver and gold prices looked puke-green puny. With the dollar turning around yesterday and following through downside today and with silver and gold prices perkier today and stocks skidding, everything looks rosier. I got to throttle back and be patient. Reality is on our side, so we can afford to be patient. Yesterday the US dollar index made a picture perfect downward reversal exactly with an intraday high almost exactly at the intraday high of the last high. Durn, that’s one confusing sentence. Try this: On 29 July the Dollar Index’ intraday high was 98.31. Next day it broke plumb down. It fell 5 days to 96.36, then began climbing. Yesterday high was 98.335, and today it dropped 13 basis points to 97.91. Looks like a double top. Shucks, y’all go look, chart on the right. Most everything hangs on this Dollar Index. Should it drop from here and make a lower low than 96.36 (last low), it cancels the chance that the dollar will rise further. 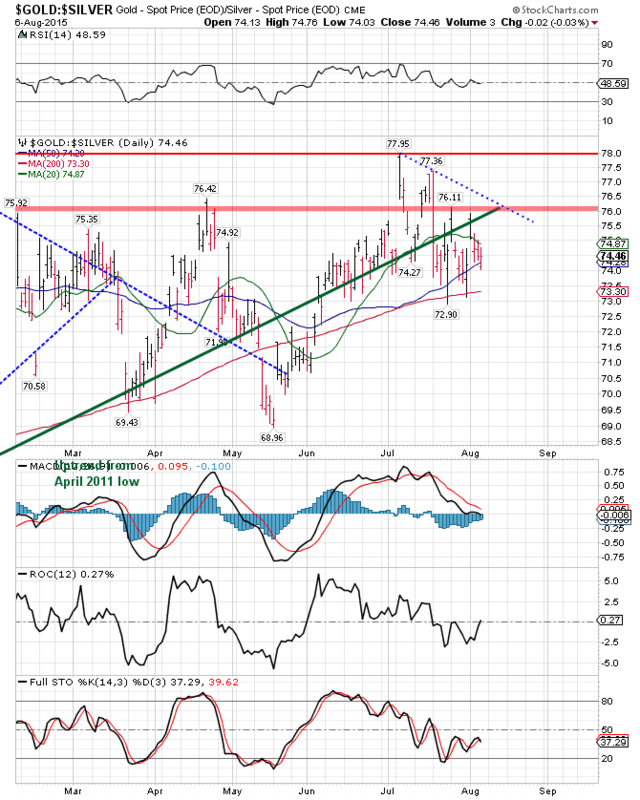 If it rises through 98.33, then the “dollar will keep rising” outcome is on. What happens to the dollar will affect silver and gold either like cholera or vitamin C.
Euro rose 0.19 to $1.0924 but that changes nothing, just the yen 0.11% higher at 80.18 says nothing. How ’bout them stocks? Flying like a cast-ahrn ayrplayne. Dow plunged 120.72 (0.69%) to 17,419.75 and the S&P500 fell even more, 16.28 (0.78% to 2,083.56. Mercy! Dow made a new intraday low at 17363! Stands way below its 200 DMA (17800) and below 17,400 will test its wings to see how many feathers it loses in a head down tornado. S&P500 hovers above its 200 DMA at 2,072.56, about 10 points below today’s close, a small move from here. YEEE-HAAAAH! Dow in gold crossed below its 200 DMA today, closing at 16 oz against the 20 DMA at 16.03. Yes, yes. 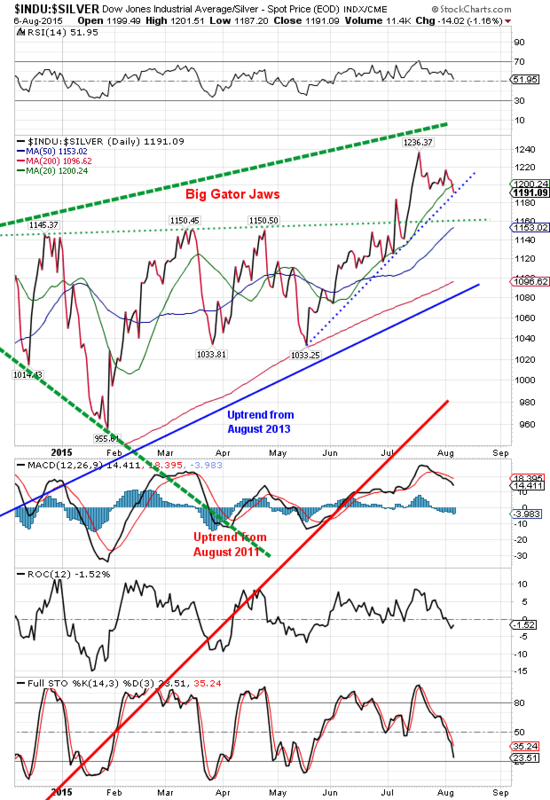 All indicators point unequivocally down. Dow in silver closed at 1,191.09 oz, also below its 20 DMA (1,200). Both the Dow in Silver and Dow in Gold are within a gnat’s eyebrow of breaking their uptrend lines.